I haven’t planned to stay in Zagreb for so long. But it happened. Maybe this is how it works with traveling that the more you want, the less it works, so the less you plan, the more satisfied you will actually be. I recently typed in Google “Visiting Vienna for free” to see what can you do in the Austrian capitol for free. It was Sunday and it turned out that on Tuesday one of the Viennese museums opens for free between 6 and 10 pm. I haven’t actually checked at but planned to spend the evening visiting it. The crowd in front of MAK (that is The Museum of Applied Arts) was not surprising – I already queued to MoMA and other New Yorker museums and galleries at the hours of a free antrance. But it wasn’t actually bad at all – two minutes and I was in! And what was in was much much more that I could have ever expected! It turned out that I was participating at the opening night of the exhibition called “The Happy Show” by a New Yorker artist of an Austrian origin – Stefan Sagmeister (about whom – as a proper alumna of cultural studies, sighhh – I have never heard before (sometimes I really feel an ignorant, really!)). So I’ve done the research only after being back home. Sagmeister was born in 1962, studied graphic design in Vienna, but after receiving a Fulbrigh scholarschip to New York, has never came back to work in Vienna. He happened to live and work in Hong-Kong and Italy, but it is New York that turned into his art base. 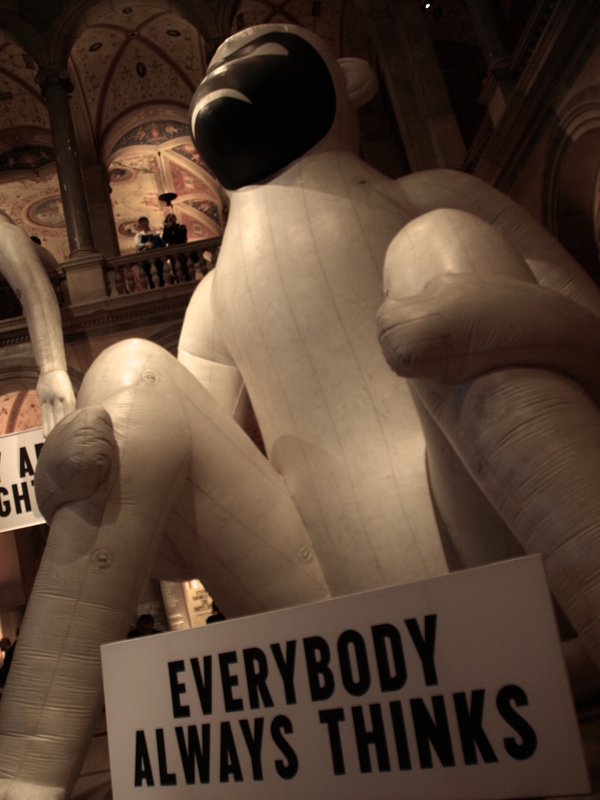 He is an artist and a typograher, co-founder of a design firm called Sagmeister & Walsh Inc. He designed the album covers for Lou Reeda, The Rolling Stones, Davida Byrne’a, Aerosmith and Pata Metheny’ego. Wikipedia says that: “Several years ago he decided to dedicate 25% of his work to the art world, things like books and publications for galleries, another 25% to the scientific community, 25% to social causes, and the remaining quarter has stayed dedicated to the music industry.” Quite cool, huh? Yesterday was exactly one month to go (to my bike trip). It’s been already the second time of “one month to go”, so I didn’t do any special action this time. 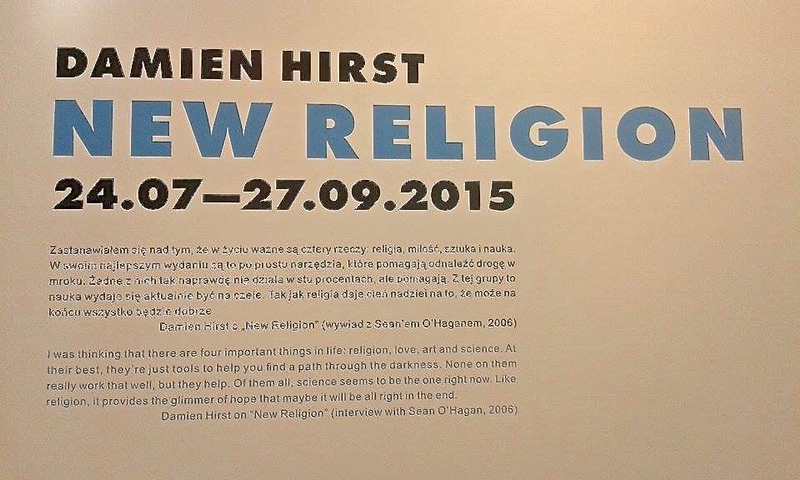 But I did my own celebration – my friend Yaelle visited me in Rio and we went to Gdańsk together, mainly to see Damien Hirst’s exhibition “New Religion” presented in Łaźnia Centre of Contemporary Art. The exhibition is tiny, presents the artpiece and a movie about the artist himself. Watching the movie about Hirst, I thought about this very famous quote of Albert Einstein “Everyone knows that something cannot be done until someone comes along who doesn’t know that it’s impossible, and does it.”. 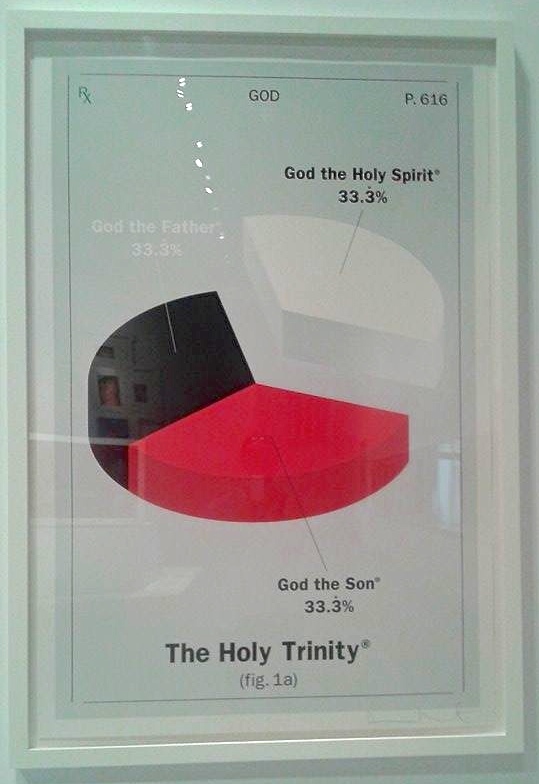 And that can probably relate to Hirst’s art as well although there is a lot of artistic insolence and conviction about his own uniqeness in it. “art is a way to make comment about the world”. And I actually think that this is exactly how I perceive art and why I like to go to different kind of exhibitions and art events. he made a COMMENT about a piece of the world he was looking at – and gave the audience a space to react – in their own minds or in the conversations with the others. Everyone can read this artpiece in a different way. I usually read art in the simpliest possible way, from my very personal perspective – built of my own experiences and the way how I see and observe the world around me. In this particular case – talking about medicine as a new religion has appealed to me a lot. The world of Hirst’s and mine are two different ones. But somehow I was able to find in his art a piece of my world. Turning from the religion and faith into medicine and sciene is a positive turn visible in (so called) Western culture, which I’m a part of – as I was born and raised in here. We trust medicine more and more and at the same time we believe ourselves and the people around less. The doctors became new gods and the pills they “serve” are new hosts that aim in giving a relief to all our pains. It reminded me the scene from the movie “Amy” after Amy was rewarded the Grammy Award and the party was over, she was sitting sad on the stage and said to a friend of hers: “You know, it’s so boring here without drugs”. I think that there is a lot of power in her words – the addiction to constant emotions, actions, beauty – all the emotions the Western culture is feeding us with, and inability to deal with the lack of them at the same time. Hirst is talking about a similiar action-reaction in the context of drugs. And maybe that’s why I quite valued this artpiece of him. The exhibition is presented in Łaźnia Centre of Contemporary Art in Gdańsk, Jaskółcza St. 1, until 27 September. Rio (Ryjewo), 16 September 2015.